A great deal has been written about the mental game of tennis; yet despite all the books, articles, and videos, players still come on the court and play scared. Why? What’s going on? Why do so many players do incredibly well in practice and then play differently, tentatively in matches? It happens all the time; coaches and teaching pros just shake their heads over this phenomenon, tear their hair out. In my experience, the reason is simple. We’ve all been conditioned—by parents, by schools, surely by society—that winning, as Vince Lombardi used to say, is everything, the only thing. It shouldn’t be. When it is, I believe it’s a handicap. Yes, winning is a great feeling, but there’s a better feeling out there—the feeling that you are playing the best tennis you are capable of, all the time; that you are playing full out, enjoying the drama, embracing the moment, relishing the opportunity to compete, learning something every time—whether you are winning or losing. And a funny thing happens when you relish and enjoy and play up to your potential—you win more. It has happened to me, exactly like that. All players know when they’re playing in fear—all players, if they are honest with themselves. It’s an “elephant in the room” that few know how to banish. 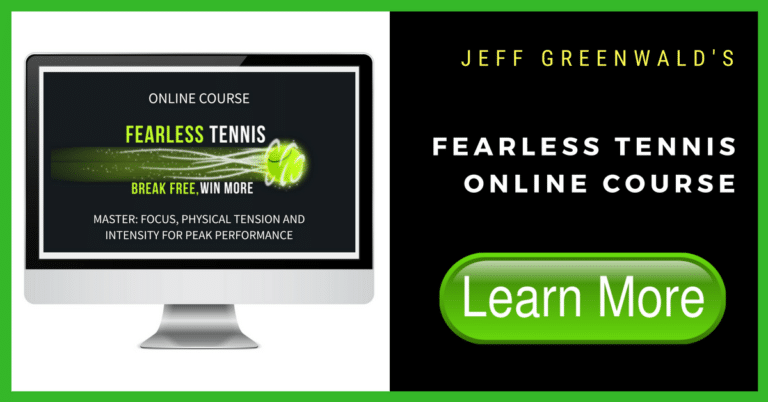 FearlessTennis addresses this universal challenge and can help players achieve real growth on the court—finally. K: In a recent interview Jeff was asked about playing without fear. As we will shortly see, detaching your ego from your performance is a powerful experience. In fact, as Jeff will describe, your best tennis is virtually impossible to achieve without this level of detachment. You talk a lot about fear in your seminars. How does fear actually affect your players? J: Players choose, oftentimes, to either play tentatively and just get the ball in or they are going to play overly aggressively because they want to get out of the point. And either reaction is really the same thing. It’s based on fear and usually fear of missing, fear of failure and the perception of what failure is. K: So, what’s the solution? J: Well, the solution is really to embrace the process, and when you start to realize that when you’d rather miss but go for it and play loose, you’ll actually win more and play better. So it’s kind of a paradigm shift for yourself when you realize that letting go of winning; letting go of the outcome, is actually going to help you play better. K: So what are the prongs of fear that you talk about in your seminars? J: Well, you know it’s funny. A lot of players talk about when the ball comes to their weakness– for example to their backhand—about the worry and so on, and it’s amazing what I’ve seen with many clients how they’re so attached to the ball– self worth, image, ego gets attached to it– their own expectations, other peoples’ expectations, and, of course, winning and losing. So when the ball comes to them, they don’t realize it but there’s this fear and so much is connected to the ball now. It’s no longer just a game. K: So, how do they get over that, the fear? J: Players need to, again, embrace the process– it’s really a complete shift in thinking where we let go of the ego and the image and all of the other things I mentioned. And it becomes really just you and the ball. What players need to do is they need to get more focused on their internal state. Emotionally– how do they feel–intensity, relaxation, and focus. So getting rid of the fear is kind of this big picture. It’s really a philosophical approach to the game. It’s very different than getting wrapped in this `how did you do; did you win’ mentality. K: When do people know that the ego is getting involved? J: When players start getting angry, frustrated and berating themselves. And, of course, this is where the inner critic comes out and loves to hide behind this. But the frustration; the emotion– that’s an obvious sign that there’s pressure building up, and this is what players bring to the court. So the ego is getting attached; it’s getting threatened from their fears around winning and losing. Again, it goes back to what I call the `elephant in the room’ which is this big outcome– the winning, the losing and the image that we put to that.